Home » Our Blog » PR and advertising – do you know the difference? PR and advertising are two of the most popular methods of promotion, however time and time again they get mixed and muddled. 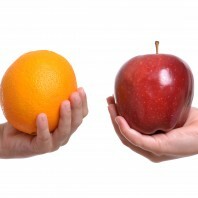 Apples and oranges are both fruit, but everyone knows which is an apple and which is an orange. So, why are PR and advertising so easily confused? Let’s go back to basics and take a look at the fundamental differences between the two. Side note: We definitely are not trying to tell you which promotion method is better (PR… ahem). Public relations is earned media. PR experts write material about your brand in the hope that editors will select the material to appear in their publication. Note we say “PR experts” because publication of the material depends entirely on creativity and quality of writing, something us experts are good at. On the other hand, advertising is paid media. You create the ad, pay for the ad and the ad is guaranteed to appear. Therefore with advertising comes control. However, this also generally makes advertising the more expensive of the two. This means only one thing for PR: credibility. Similar to word-of-mouth recommendations, with a third party endorsement, customers are more likely to trust your brand. With advertising, the message comes directly from the brand itself, meaning credibility can be lower. Whilst PR is a mix of proactive and reactive promotion, PR is especially good at building your corporate reputation and handling any company crises. When your brand is in meltdown, PR can help put out the fire quickly and effectively. Advertising is usually entirely proactive promotion. And, as you pay for the space, your ads can be repeated over and over, making advertising great at building brand awareness. “A good PR story is infinitely more effective than a front page ad.” Richard Branson. Okay, that quote might be a little biased. What we mean to say is PR is about story-telling. A well-written PR piece provides editorial integrity and will resonate well with the reader. Advertising’s primary purpose, on the other hand, is to motivate people to buy your product/service. “Purchase now”, “contact us today”, “offer ends soon”. With some creativity and repetition, these messages can be extremely persuasive. All bias aside, PR and advertising are both extremely effective methods of raising awareness, generating new business and enhancing your brand image. But it’s important to know your promotions and know which method is best for your brand. Still confused? Give us a call on 0161 973 6763 and we’ll be there to guide you.